In order to enhance measurement of resilience, and to better understand and target interventions that will enhance resilience, the Technical Consortium is developing a pilot spatial tool. The purpose of this resilience-modeling tool is to assist IGAD member states in the Horn of Africa in identifying areas of high and low resilience to known hazards, initially focusing on resilience to drought specifically. The tool overlays multiple data layers indicating linkages and dynamic interactions between key indicators in systems affecting resilience. The result is a mapped output depicting a region’s relative resilience, derived from weighted indicators from three key systems: economic, social and ecological. This identification of relative levels of resilience geographically will provide an opportunity for better targeting of investment projects proposed in the drylands’ investment plans for the respective countries. The pilot development of the spatial tool will be trialled with various drought and environmental planning agencies in the IGAD member states to understand its utility in better enabling the targeting of investments and projects for the most impact in building resilience. Ultimately, it will allow governments in the Horn to host a sector-specific investment platform for improved planning and resource allocation. The Technical Consortium is currently in the process of developing two versions of the drought module to sit within the spatial tool. Both versions will combine population estimates with the calculation of resilience, in order to focus potential investments on those areas that will see the biggest impact in terms of people helped. The outputs will be similar to those already produced by the spatial tool; a summary map and spreadsheet. Version 1 uses medium- to long-term data on drought exposure risk to identify areas, across the entire Horn of Africa region, that are in need of resilience investment. It is envisioned that Version 1 will be useful to potential investors considering a variety of sectors such as water management, early warning information systems and conflict reduction. Version 2 highlights pastoral and agro-pastoral localities where farmers and dependents may be at risk of significant livestock mortalities in the short-term. 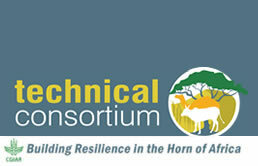 It is based on short-term rainfall estimates at high geographic resolution and encompasses the outputs of the livestock-vegetation model developed for the Horn of Africa Resilience Project. These outputs are confined to the pastoral and agro-pastoral land use regions. Version 2 will include a new, high-resolution ‘drought exposure’ layer; the existing ‘time to recover’ layer; and a modified ‘environmental sensitivity’ layer. It is envisioned that Version 2 will be used to identify those areas where investments, such as the promotion of stock movement and reduction, will see the best results. Version 2 may be developed into an early warning system for livestock farmers if the datasets are updated and with possible linking to the Southern Oscillation Index. Discussions are underway on the possibility of a ‘futures analysis’, which can factor in projected climate change, loss of cropland etc.